Through my work and personal life, I am in fairly regular contact with Howard, the father of a couple of girls that I went to high school with. His family, like mine, like mine, are descended from the "Germans from Russia" who farmed in Ukraine for a few generations; in fact, we recently discovered that, for a time, his family lived in the very same county and town in North Dakota that my own family did. Given the time frame, Ron, wouldn't the curing salt have been saltpeter? I'll double-check with him the next time I see him, but I'm fairly certain it is intended to be Tender Quick. To my knowledge, TQ has been around since the 30s, maybe even earlier. Also, that much saltpetre in 2 pounds of burger would at best make you sick and at worst would probably kill you. 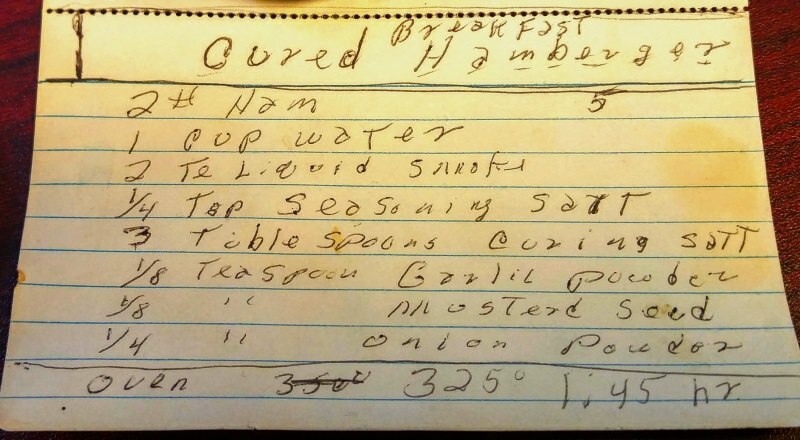 After some checking with some guys who do a lot of curing, and also talking with Howard, I confirmed that it is definitely Tender Quick; however, we both agreed that the amount of TQ is too much, even though it is as his father wrote it down. A note on the logs: he made them at half a pound each; about 6 inches long, with the diameter perhaps of a Coke bottle. This matches the one that he brought to me, as far as I can tell.